It’s that time of year again – the time when hundreds of Santas will descend upon towns and cities across the country. 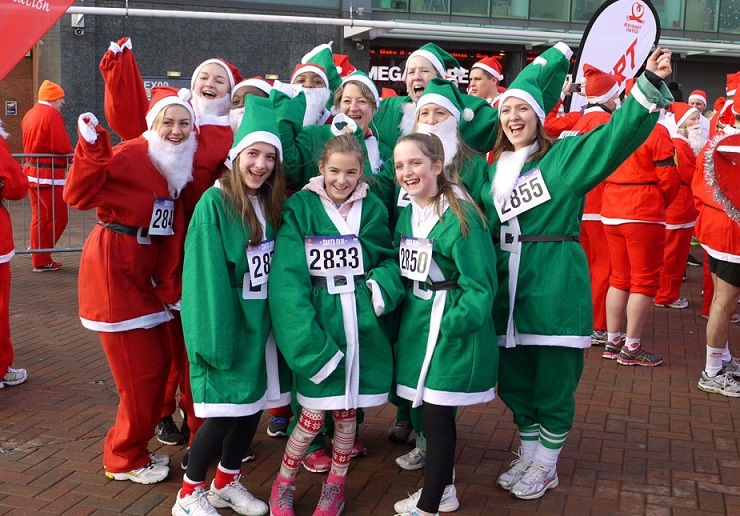 Join us, pharmacy students and enthusiastic pharmacists keen to raise funds for Pharmacist Support and become a Green Santa Runner at Old Trafford Manchester or Victoria Park London on 4th December 2016! The Santa Run is a great event for families and suitable for anyone of any ability; all you need is a good pair of running shoes! It’s also advised to get a bit of training in first to help you prepare – tips and schedules to set your targets and help you achieve your goal can be found on the DoitforCharity and the NHS Couch to 5K websites. Team Green Santa is a team of mixed abilities and ages. Our aim for the day is to have fun and raise some cash! A free red Santa suit and medal will be provided for all runners on the day, but for a small donation of £5 you can upgrade your red to green. Run, jog or walk – this event is all about the taking part, not the winning. All you need to do is pledge to raise £100 for Pharmacist Support and reserve your place! 4th December 2016 Manchester United Foundation Santa Run (2km and 5km) at Old Trafford. The 5km Santa Run starts at 11.30am and will take in the sights of the Imperial War Museum, The Lowry and Media City UK before crossing the finish line under the West Stand. The 2km Family Fun Run is one for all the family as you make your way around the stadium, before crossing the finish line under the West Stand. This route is fully wheelchair/buggy accessible. To register for the Manchester United Foundation Santa Run click here or contact us for an information pack. Once you’ve chosen your ticket, there is a dropdown menu on the next page where you can select the charity you are running for and Pharmacist Support is one of the options. There is also a box for an additional donation on the registration page. Please note that this is a donation that will go towards the Manchester United Foundation and not to Pharmacist Support. Free parking will be available on the day, but please note there will be a number of road closures for the event (we’ll keep you updated after signing up). You can register and collect your Santa Suit in the International Suite from 9.30am where the Pharmacist Support team will be warming up and waiting to meet you! We’re counting on your support and very much Ho Ho Hoping you can join us!